Posted: Tue Jun 03, 2014 3:19 pm Post subject: Equal House System in Renaissance Astrology? I recently attended an astrology workshop with Geoffrey Cornelius. 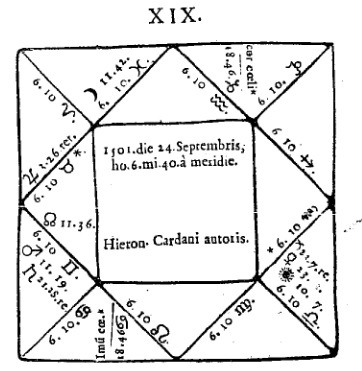 During the workshop Geoffrey showed us a horoscope delineated by the great Italian renaissance astrologer Girolamo Cardano (1501�1576) (French: J�r�me Cardan; Latin: Hieronymus Cardanus) While it was irrelevant to the point Geoffrey was illustrating I was rather struck by Geoffrey�s passing comment that the chart used by Cardano was utilising equal houses. I had formed the impression that that equal house cusps had largely stopped being used after the time of the Roman astrologer Firmicus Maternus. Certainly by the late classical era. Moreover, Ben Dykes research suggests the replacement of whole sign houses by quadrant house systems in later Perso-Arabic astrology. The impression often given is that quadrant house systems became universal in the medieval period. Equal houses are often presented as a development of British late 19th and early 20th century astrologers. They appear to have thought they were reviving what they understood as the original and most ancient house system. But as we now know that appears to have been whole sign houses not equal houses. How then do we explain this presence of equal houses in a renaissance source like Cardano? Was Cardano influenced by a translation of Firmicus Maternus? Has anyone come across other renaissance examples of astrologers using equal houses? Posted: Tue Jun 03, 2014 3:43 pm Post subject: Re: Equal House System in Renaissance Astrology? When Morin sets out to refute 'erroneous' house systems in Book 17 of the Astrologia Gallica, equal houses is the first system he attacks. He says that 'it was particularly cultivated by the ancients down to our times, so that Cardan strove to demonstrate the truth of astrology by 100 nativities erected in that system'. Holden's footnote states that Morin's contemporary Nicolas de Bourdin, Marquess of Villennes, favoured equal houses. I had formed the impression that that equal house cusps had largely stopped being used after the time of the Roman astrologer Firmicus Maternus. Certainly by the late classical era. You mentioned Manilius describing Equal in his Astronomica awhile ago. Were you able to locate the reference? I would really appreciate it. Equal houses are often presented as a development of British late 19th and early 20th century astrologers. They appear to have thought they were reviving what they understand as the original and most ancient house system. But as we now know that appears to have been whole sign houses not equal houses. We may never know for sure which house system is the oldest one, but I think it is clear that Equal is a really ancient system. It looks like not only Manilius was using it, but also Ptolemy, and possibly Valens. So without a doubt many less prominent astrologers of the time were using it as well. Then let's not forget that India seems to have taken over Equal from Hellenistic astrology, even though in a variation with the house cusps off-set by half a sign (to compensate for their off-set sidereal zodiac, I wonder? Just kidding... ). Very interesting questions! I wish I already had good answers to them, but I will certainly keep my eyes open wide. To begin with, do we know exactly where Cardano mentions Equal? Also, do you have a reference for Firmicus Maternus talking about Equal (other than depicting it in his Thema mundi)? Thanks. 3. The second house from the ascendant is located in the second sign, begins from the thirtieth degree from the ascendant, and extends its influence through the next thirty degrees." I discussed this with Martin Gansten, who agreed that the Holden translation conveys a similar meaning. So it is probably not an error in translation. Also compare this whole chapter with Chapter XV in page 44. You will see something that is consistent with Equal Houses. Thanks Martin. I do really need to study Morin! I don�t recall doing that. If I did it was an error. I clearly meant Firmicus Maternus in his Mathesis. 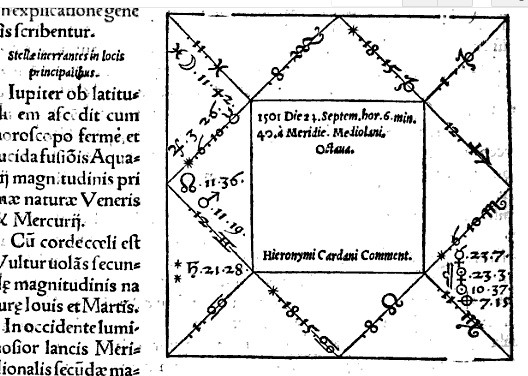 As the Astronomica is really a poetic description of astrology its often hard to decipher what Manilius is describing in more technical areas like house systems. As I recall Deborah Houlding thinks his decription of the houses would be consistent with a space based system like Campanus. However, in a thread debating the origin of house systems a few years ago on Skyscript Chris Brennan argued the system being described was more likely to be whole sign houses. The majority of astrologers that have examined the sources seem to take the view that Whole Sign was the likely default of all the latter systems. Its wise though to retain an open mind on the subject of house system development. Once we think we know the answers we stop asking questions. Variations certainly seem to seem to have been used from an early period. Apart from Whole Sign houses , Porphyry, Equal and Alcabitius all seem to have been the house systems in use in the hellenistic era. So without a doubt many less prominent astrologers of the time were using it as well. If you mean the renaissance then it appears so. If you mean hellenistic astrology we are getting into the realm of speculation. Most of the earliest preserved horoscopes do appear to be whole sign. However, porphyry makes an appearance very early too. The philosophical basis for equal seems to derive from Dorotheus of Sidon (1st century CE) who argued the influence of the ASC extended for 30 degrees. Deborah Houlding also highlighted a section of Valens where he appears to be using equal houses. Other sections of his Anthology are based on whole sign and porphyry! Its really unclear whether Valens worked with all these different systems simultaneously or whether these systems could reflect different periods in his astrological praxis. The question of what house system Ptolemy was using has been a topic of astrological controversy since ancient times! Its been discussed numerous times on Skyscript. The basic truth is that Ptolemy says extremely little about houses and seems rather uninterested in using them. His exceedingly few references are rather cryptic. Different astrologers attempt to �fill the void� with different explanations. Frequently, these theories say more about the astrologers presenting them than Ptolemy himself. For example, as early as the 3rd century CE the astrologer Pancharius suggested in his commentary on the Tetrabiblos (Book II) that he could detect Ptolemy was using a time based system of houses. Pancharius seems to have been the first proponent of Alcabitius houses. This reminds me of the early modern astrologer Placidus de Titis (1603�1668) who thought Ptolemy was using a time based house system and proposed the house system that carries his name. In both instances these astrologers seem to have considered Ptolemy�s method of primary directions was an indicator of his preferred house system. However, there is really no logical reason why this has to be the case. Amongst contemporary astrologers George Noonan and Benjamin Dykes have supported the notion Ptolemy was probably using equal houses ( with an idioyscratic variation starting 5 degrees before the ASC). Chris Brennan has argued Ptolemy was using whole sign houses in a short article. Then let's not forget that India seems to have taken over Equal from Hellenistic astrology, even though in a variation with the house cusps off-set by half a sign (to compensate for their off-set sidereal zodiac, I wonder? Just kidding... ). I don�t think that is correct Michael. Ancient Indian astrology seems to have adopted Whole Sign and Porphyry houses. In the middle ages a variant on porphyry was adopted called Sripati. In Sripati the porphyry house cusps are the centre of the houses. The 20th century Indian astrologer B.V. Raman did seem to adopt an approach to equal hoses identical to the German astrologer Vehlow. However, I have yet to see any evidence confirming that approach to houses is that old in India. Unfortunately, I cannot recall which text of Cardano this referred too. However, from the quote from Martin above its evident Cardano made extensive use of this system. Hopefully Margherita Fiorello will come to our rescue as she often does on such questions! I will pick this up later as there is a bit of controversy on whether Firmicus Maternus was using exclusively equal houses or a fusion of whole sign houses with equal house cusps. The latter is a theory proposed by Robert Hand in his book on whole sign houses. But don't know this - many suppose it, but the question is as open now as it ever was. All we know is that references to quadrant systems and equal house systems appear within our oldest sources. Whilst there is ample evidence of a whole-sign approach being used in practice, there is no ancient source I am aware of that describes that approach as being the theoretically correct one, or the one for which house division was originally intended. The question of which house systems were favoured by various celebrated astrologers is an interesting one. Cardan was a brilliant mathematician, so if he adopted the equal house system it must have been because he believed its principles were correct. I wasn't aware of this before now though, so will also be interested seeing it confirmed. I was trying to present a representative sample of views within the traditional astrological community today. The list of astrologers supporting that statement is long and quite prestigious. Still, that doesn't mean they are necessarily right. There is often a danger with group thinking that it becomes uncritical and people stop enquiring. You are probably the leading critic of that view today. Hence it was interesting that it took you to highlight Valens using equal houses in the Anthology while those who one would assume had studied that text in considerable detail either ignored or de-emphasized this. Perhaps because they had already convinced themselves of a particular viewpoint and stopped enquiring. Having said that I think very few of us come to the subject of house systems without some pre-conceptions. Whether conscious or not there is often a discernable attempt to validate our chosen approach. I do think a good case can be made for whole sign as the likely earliest system based on the available evidence we have. However, that is a thread topic in itself which isn't why I created this thread. I dont really wish to take this thread any further in that direction. I will simply repeat the comment from my above post which you chose not to highlight. Its wise though to retain an open mind on the subject of house system development. Once we think we know the answers we stop asking questions. ..Apart from Whole Sign houses , Porphyry, Equal and Alcabitius all seem to have been the house systems in use in the hellenistic era. I wondered if this might be due to the influence of Firmicus Maternus? One of the ancient texts widely available in the renaissance period. His views on Ptolemy's approach to houses would be interesting too. Cardano wrote a commentary on the Tetrabiblos I think? Pure speculation on my part but perhaps he thought Ptolemy was using equal? Ps Margherita if your out there please post your thoughts! http://filolinux.dipafilo.unimi.it/cardano/testi/opera.html ). I think there will be many similar examples within that text which show Cardan using Regiomontanus cusps. Modern recalculation shows the data to be 10:44 pm 3rd Aug, 1552 JC (Julian Calendar), Lat 54�, (Regio cusps). Do you know any other Medieval or Renaissance astrologers who were using Equal? no, I don't remember anybody. Not It seems to me Cardano's mortal enemy Luca Gaurico used Regiomontanus. This is an extract from Cardan's Seven Segments, translated by V.Livina & A.Grigoryev, 2009. Mark, you should find the editorial comments on pp.6-7 interesting with regard to the influence of Firmicus. Also, this Google Book link shows Morin's remarks about Cardans use of equal house, and why Morin thought it wasn't descriptive of Cardan's nativity. I'm sure I read Cardan's description of his own nativity years ago, and that he dwelt upon how aptly the 12th house Moon described him. So now I am confused about this, because by equal house it's an 11th house Moon. Nothing strange. Just he switched system in the second part of his life, maybe after having read the new translation of Tetrabiblos during his travel in Scotland.